Everyone has hobbies— some like going to the gym for a quick work out and others like whipping up pastries in the kitchen, but neither of those hobbies is for you. Your go-to hobby involves a keen sense of sight, lots of patience and the great outdoors. You're a four-leaf clover hunter and you're serious about it. Ever since the tender age of 7, you've been picking through the prairie, foraging for a coveted four-leaf clover. You're diligent, never missing a day of foraging, even when it's raining because you're certain you'll find one... one day. It's your destiny! In order to raise your vibrations and increase your luck, dress as a plucky leprechaun. Good news, you can find everything you need right here so it's one less thing to go hunting for. The green clover necktie will (hopefully) give you the luck needed to find what you've been searching for all these years. 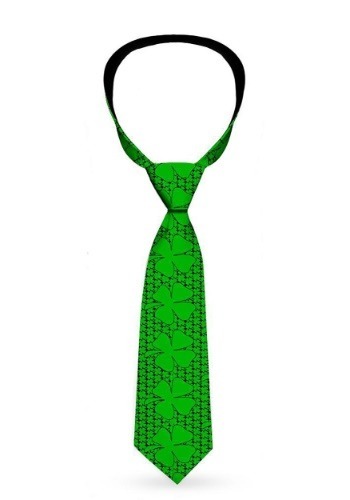 The Saint Patricks Day's lucky clovers necktie is approximately 58-inches long with a mixture of both small and large shamrocks throughout. The tie fastens around the neck with a convenient stretchy band. Increase your luck by wearing one of our complete and exclusive leprechaun costumes.